The rating plate of an Extra Low Voltage Power Supply Unit (ELVPSU) shows various symbols and abbreviations representing ratings, class, insulation, polarity and other electrical safety and EMC compliance details. The polarity symbol on the rating plate of an AC to DC power supply indicates if the centre (or tip) of the output plug is positive (+) or negative (-). It is important to use a power supply having the correct polarity for the host device. Reverse polarity may result in malfunctioning or damaged equipment. Indicates that the centre (tip) of the output plug is Positive (+) and the barrel of the output plug is Negative (-). Indicates that the centre (tip) of the output plug is Negative (-) and the barrel of the output plug is Positive (+). The following abbreviations used in conjunction with a numeric value, are used to define nominated electrical characteristics of a power supply unit. Has an associated external protective device. There are two types. An inherent type is s/c proof provided that the temperature rise does not exceed the specified limit. A non-inherent type is equipped with an external protective device. The non-short circuit-proof transformer symbol or the short-circuit-proof transformer symbol can be combined with either an Isolating transformer symbol or with a Safety isolating transformer symbol to produce a composite symbol. 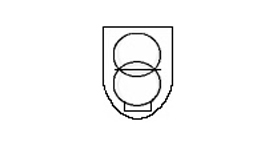 In this example, the Short-circuit-proof symbol is used in conjunction with the Safety isolating transformer symbol. A C-Tick mark appears on products which are required to comply with Australian electromagnetic compatibility requirements and with Australian radiocommunications standards. It signifies that the product may be legally sold in Australia.